Ablation of the slow pathway (SP) has become a simple procedure used to cure atrioventricular nodal re-entrant tachycardia (AVNRT). This can usually be achieved by radiofrequency ablation of the SP region, anterior to the ostium of the coronary sinus, at the base of the triangle of Koch. AV conduction is preserved because of the conduction over the fast pathway at the superior portion of the triangle of Koch. The exact role of the SP in the human heart, whether the SP is the "appendix" of the heart and can be removed safely or it has a role in the completion of AV conduction, is not clear. In this report, we describe an unusual form of an intermittent second-degree heart block following SP ablation, in spite of the well-preserved fast pathway ablation. 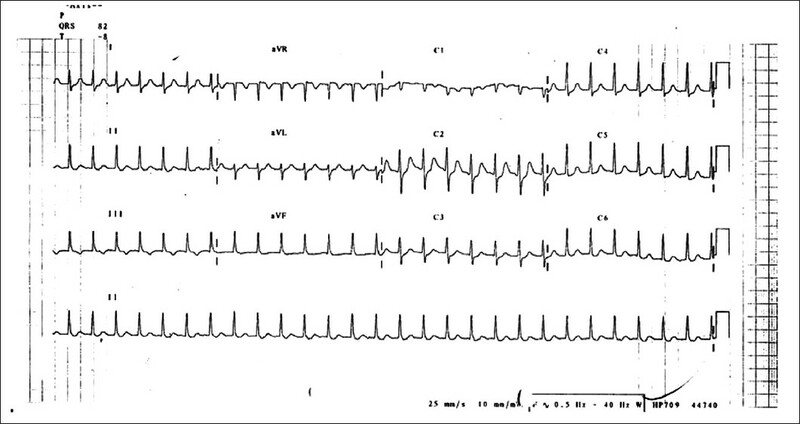 A 21-year-old female patient presented with regular narrow complex tachycardia suggesting a re-entry form of tachycardia [Figure 1]. She was on medical treatment. She underwent an electrophysiological study that provoked AVNRT. This had a typical form of slow-fast re-entry with a cycle length of 380 ms. With the use of standard radiofrequency energy measures, the SP was successfully ablated in two successive applications. Post ablation, no tachycardia was inducible and no SP conduction was observed. AV block occurred at 600/360 milliseconds. Atrio-Hisian, His-ventricular and PR interval measurement were 80, 45 and 130 milliseconds, respectively. The patient was discharged and remained free of tachycardia for 1 month. She presented later with brief palpitation that was precipitated by emotions such as anger and anxiety. Electrocardiogram (ECG) showed no abnormalities in the emergency room. The patient was kept under observation for 24 hours, during which time she complained of palpitation early in the morning after waking up from sleep. 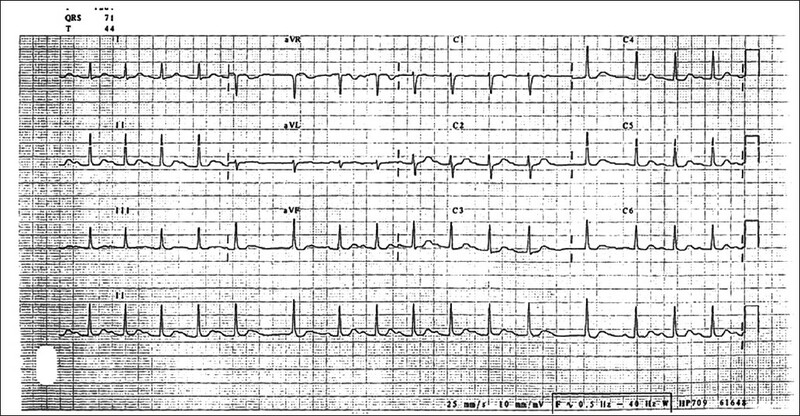 An ECG was performed which further revealed a transient train of long Wenckebach [Figure 2] where recurrent dropping of P waves was observed followed by spontaneous recovery. In order to evaluate the AV node function further, the patient was subjected to treadmill exercise test which showed normal heart rate response to exercise. With peak exercise, the heart rate increased to 180 beats/minute, with no evidence of heart block or PR prolongation [Figure 3]. Subsequently, the patient reported multiple bouts of similar symptoms during emotional exertion. ECG revealed Wenckebach phenomenon in extended event rhythm monitor. The patient was started on a small dose of beta blocker under close observation. She responded well and became asymptomatic since then. In our case, an unusual type of low-grade, second-degree block (type one) occurred intermittently, which had otherwise not been seen in the EP laboratory following ablation. It was believed that the heart block occurred in a very conditional circumstance of autonomic imbalance, and therefore, could not be provoked in the laboratory. Essentially, a high baseline vagal tone with a sudden gush of sympathetic activity was needed to demonstrate this type of block. This triggered sinus tachycardia as an initial phase, while the AV node was still recovering from the high vagal effect. This zone of autonomic imbalance was usually handled well by the SP, whenever the fast pathway was blocking. This phenomenon was also seen during Holter monitor in otherwise healthy, non-ablated, young people, when they developed a transient, asymptomatic, first-degree heart block as an indication of AV conduction occurring over the SP. The absence of the SP after ablation created a new physiology for such patients, where these episodes of a symptomatic, first-degree, heart block were converted to a symptomatic, type-one, second-degree heart block. The use of beta blockers helped in reducing the sinus node sympathetic relative hyperactivity and reduced the sudden increase in the rate (steep curve A-A interval decrementation), making the fast pathway refractoriness range accommodate this blunted curve of A-A decrementation, until a further pick up of AV conduction by a full sympathetic stimulation occurred, as seen in our case. Due to its peculiar conduction property with a shorter refractory period and slower conduction velocity, SP had a very settled, but important role in making the AV node more capable of handling a wider range of intrinsic autonomic fluctuation. SP ablation and/or modification in AVNRT is a curative approach. The elimination of an SP can rarely deprive the AV node from its full function of handling the AV conduction during some unusual autonomic imbalance. Testing of the fast pathway conduction at rest, following SP ablation, does not necessarily reflect its behavior under a different autonomic environment. Routine use of Isoprenaline alone following SP ablation addresses the sympathetic effect only, similar to that with treadmill exercise. The evaluation of the AV conduction pattern during the switching zone between the high vagal tone to an accelerating sympathetic discharge is challenging. However, careful evaluation of the AV conduction pattern, probably with Holter monitoring, can help to identify patients who are in a great need for their SP conduction. 1. Lipscomb KJ, Zaidi AM, Fitzpatrick AP. Slow pathway modification for atrioventricular node re-entrant tachycardia: Fast junctional tachycardia predicts adverse prognosis. Heart 2001;85:44-7. 2. Liberman L, Hordof AJ, Pass RH. Rapid atrial pacing: A useful technique during slow pathway ablation. Pacing Clin Electrophysiol 2007;30:221-4. 3. Kowallik P, Escher S, Peters W, Braun C, Meesmann M. Autonomic modulation of the sinus and atrioventricular nodes following posteroseptal ablation for treatment of atrioventricular nodal reentrant tachycardia. 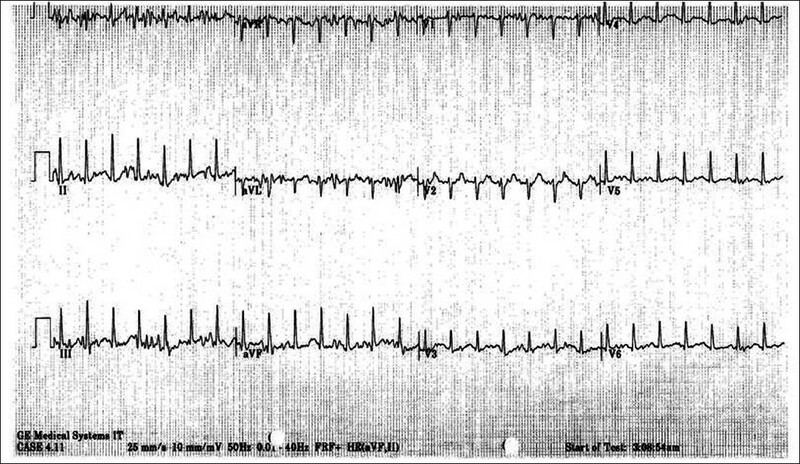 J Cardiovasc Electrophysiol 1998;9:567-73. 4. Csanadi Z, Klein GJ, Yee R, Thakur RK, Li H. Effect of dual atrioventricular node pathways on atrioventricular reentrant tachycardia. Circulation 1995;91:2614-8. 5. Natale A, Klein G, Yee R, Thakur R. Shortening of fast pathway refractoriness after slow pathway ablation. Effects of autonomic blockade. Circulation 1994;89:1103-8.